Information is the key to success in today’s business environment. The demands of customers, competitive forces and escalating costs, force us to look at all facets of our business and to seek out better ways to do things. Just as business information systems must be flexible enough to respond to shifts in markets, organizational structures, and business methods, our production facilities must also be able to react to change. Just in time is not only mandatory to feed our assembly lines, but also to feed the appetites of customers who have far more choices today than ever. Organizations have spent hundreds of thousands of dollars on ERP systems to meet these demands, but what value do they have if plant occurrences are recorded at the end of the day or at the end of a shift. The faster pace of business requires better responsiveness. When decision makers have real time access to relevant information, it’s easier to reorganize to meet new and changing demands. Decision makers can increase operational efficiency by adapting production according to market demand. Communication between processes and the planning environment need to be automated in order for the Enterprise to operate effectively. 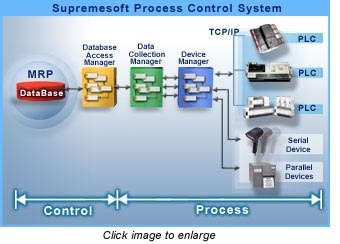 To meet these demands, Supremesoft has developed the Supremesoft Process Control System (SPCS). This application framework is written completely in the Java programming language and makes extensive use of XML. The result is a comprehensive and flexible environment designed to meet the demands of modern manufacturing facilities. It is a fully supported application that is configurable, scalable and platform independent. It is designed to easily fit into your existing environment. Supremesoft’s innovative Device Manager is the communication link to any physical device on the plant floor, regardless of its communication protocol. The powerful Data Collection Manager allows you to map information from these physical devices, through the Database Access Manager to your chosen database or application. By acting as a bridge to existing legacy systems, your current investment in application software is protected. Communication is a two way street and SPCS also allows for communication from the application to the device, thus the definition Process Control. 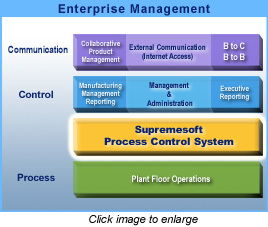 The Supremesoft Process Control System provides a secure, reliable, performance oriented system that allows for instant information access from plant floor operations. It also provides the flexibility to create, test and implement new applications based on a wealth of information not previously available. Information access that will keep your production facility at the forefront of today’s demanding marketplace. Supremesoft is committed to becoming a leading implementation partner that can help a manufacturing organization become part of the Enterprises’ competitive advantage by taking out cost, increasing speed and agility, and enhancing operational connectivity and transparency. By providing the right information at the right time Supremesoft can help make the manufacturing organization more effective in developing and delivering products, thereby helping make the company more effective and competitive in the marketplace. Additional platforms and versions of the above platforms may also be supported. Also, new platforms are being certified on an ongoing basis. Please call us for the latest updates.